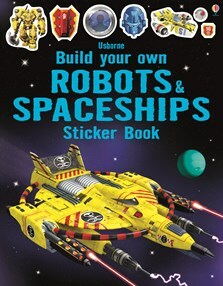 From pirate spaceships to flying robots, children can build over 40 of the most deadly machines in the galaxy using 20 pages of stickers of stun guns, turbo engines, rocket boosters and more. Each robot and spaceship comes with a statistics table of its unique functions and weapons, plus its particular strengths and weaknesses. asteroid mining craft and use stickers to add stun guns and laser cannons. My son got his robot sticker book from my sister who is, at the moment, living in the UK. He is deeply in love with it and I have to prevent him from doing the book in one go (he almost sleeps with it).